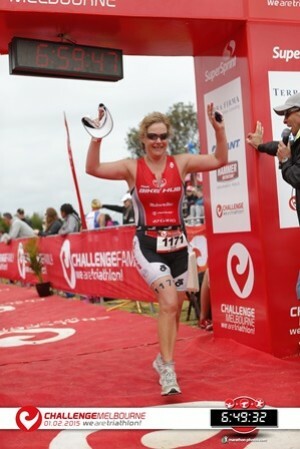 I managed to complete the Challenge Melbourne Half Ironman. It was an incredible day and I am still pumped and elated, days later!! It was a shocking weather day though; could hardly see the buoys in the sea - dark, cloudy, windy and really big waves as I took off at 6.25am; then got rained on for the whole of the bike leg and could hardly feel my toes at the end of the 90km. Then the run – good conditions for that, just hard work for the half marathon. Managed to get the job done though, in 6 hours 49 mins. Took a bit longer than planned but I came home without an injury.... and very, very happy. I truly believe I could not have done this event without Belinda’s help. She has been a true inspiration and motivation source for me, and whilst I kept it as a secret from her from some time (i.e my entry into Challenge Melbourne), she has always been tuning and developing my programs with all my personal goals in mind, be they ocean swims, bike rides, triathlons or just keeping my health and fitness at a level where I can cope with high pressure corporate I.T sales and the demands of 2 teenage children going through VCE.